Didemnum candidum is a common white or gray colonial ascidian that forms patches or mounds. 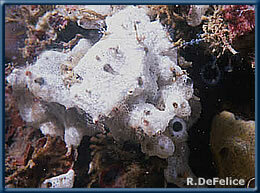 These patches can be quite extensive, overgrowing worm tubes, sponges, ascidians, and algae in the fouling community. Didemnids are very difficult to identify, even for an expert. They can not be identified in the field. The tiny zooids must be extracted from the tunic, which is nearly impossible, and this has led to the confusion of didemnid taxonomy. Didemnum candidum is one of 4 or 5 white or gray species in this Family in Hawaii, and examination of a taxonomic key (e.g. Abbott et al. 1997) is required for positive identification. In shallow water, primarily in the fouling community of protected harbors and embayment, but also on the reefs in Kaneohe Bay. Grows on all substrates, even living animals and algae. Unintentional, as fouling on ships' hulls. Fouling species. Ecological impact unstudied in Hawaii, observations suggest some competition for space with other shallow-water species in harbors and embayments. Ascidians are suspension feeders that use a mucous net to filter plankton from the water. Ciliary action moves water into the oral siphon and to the pharynx which resembles a basket. As water is pumped through slits in the pharyngeal basket, out the atrial siphon, it passes through a layer of mucous coating the inside. When the mucous sheet is clogged with food, special structures pass it to a short esophagus and into the stomach. This species is hermaphrodite, with a simple reproductive system. Fertilization is external, and after a time in the plankton the free-swimming tadpole larvae will settle and metamorphose. The name Didemnum candidum has been applied to a staggering number of populations of a similar-looking taxon around the world; the species may be one of the most widely-recorded ascidians in the world (Van Name, 1945; Eldredge, 1966). Its cosmopolitan nature recalls Van Name's (1945) famous statement regarding this species: "I am far from being able to overcome the fear that I am confusing more than one species...". More than 50 years later, the species is still in need of revision. Records from Hawaii commence with Paul Galtsoff's collections in 1930 from Pearl and Hermes Reefs (Tokioka, 1967). Eldredge (1967) reported it from several stations on Oahu (Kaneohe Bay, Ala Wai Yacht Harbor, Pearl Harbor, and off Barber's Point) based upon collections from 1961 to 1963. Long (1974) and Hurlbut (1991) further reported upon Pearl Harbor populations. Hurlbut (1991) examined patterns of larval abundance, settlement, and juvenile mortality in Pearl Harbor. Didemnum candidum's greater abundance at shallow depths on floats as compared to greater depths on pilings is due to greater larval settlement near the water surface directly related to the surface location of larvae-producing adults, and to the larvae being photopositive and geonegative. She also noted that colonies of Didemnum candidum on settling plates at 0.5 meter depth are capable of releasing larvae at 6 to 8 weeks of age. Originally described from the Red Sea, it was reported in the 1880s and 1890s from stations as far spread as Brazil, New Zealand, the Antilles, and off Mozambique indicating that some measure of widespread dispersal by ships had already been achieved. It now also occurs in Australia and New Zealand, the western Pacific Ocean, Indian Ocean, the western Atlantic Ocean, and the Mediterranean , as well as western Europe, and the Philippines, Gilbert, Palau, and Galapagos Islands (Tokioka, 1967). Whether it originated in the Indo-Pacific, or elsewhere, is not clear. Abbott, D.P., A.T. Newberry, and K.M. Morris. 1997. Section 6B: Ascidians (Urochordata). Reef and Shore Fauna of Hawaii. Bishop Museum Special Publ. 64 (6B). Eldredge, L.G. 1967. A taxonomic review of the Indo-Pacific didemnid ascidians and descriptions of twenty-three Central Pacific species. Micronesica. 2: 161-261. Hurlbut, C.J. 1991. The effects of larval abundance, settlement and juvenile mortality on depth distribution of a colonial ascidian. J. Exp. Mar. Biol. Ecol. 150: 183-202. Long, E.R. 1974. Marine fouling studies off Oahu, Hawaii. Veliger. 17: 23-39. Tokioka, T. 1967. Pacific Tunicata of the United States National Museum. U.S. Natl. Mus. Bull. 251: 1-247. Van Name, W.G. 1945. The North and South American ascidians. Bull. Amer. Mus. Nat. Hist. 84: 1-476.